Figure 1 combines the AS curve and the AD curve from Figures 1 & 2 on the previous page and places them both on a single diagram. 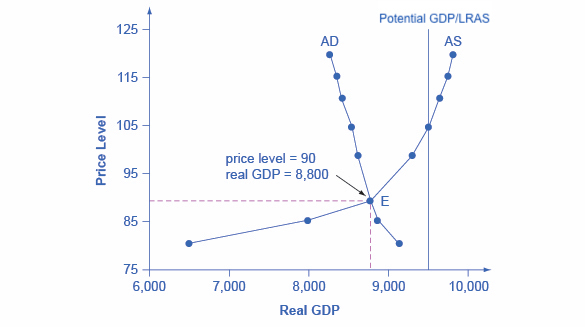 The intersection of the aggregate supply and aggregate demand curves shows the equilibrium level of real GDP and the equilibrium price level in the economy. In this example, the equilibrium point occurs at point E, at a price level of 90 and an output level of 8,800. Figure 1. Aggregate Supply and Aggregate Demand. The equilibrium, where aggregate supply (AS) equals aggregate demand (AD), occurs at a price level of 90 and an output level of 8,800. 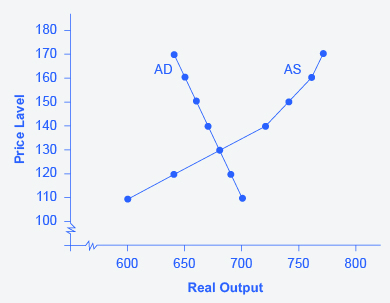 To begin to use the AS–AD model, it is important to plot the AS and AD curves from the data provided. What is the equilibrium? Step 4. Look at Figure 2, which provides a visual to aid in your analysis. Figure 2. The AS–AD Curves AD and AS curves created from the data in Table 1. Step 5. Determine where AD and AS intersect. This is the equilibrium with the price level at 130 and real GDP at $680. Confusion sometimes arises between the aggregate supply and aggregate demand model and the microeconomic analysis of demand and supply in particular markets for goods, services, labor, and capital. For example, the vertical and horizontal axes have distinctly different meanings in macroeconomic and microeconomic diagrams. The vertical axis of a microeconomic demand and supply diagram expresses a price (or wage or rate of return) for an individual good or service. This price is implicitly relative: it is intended to be compared with the prices of other products (for example, the price of pizza relative to the price of fried chicken). In contrast, the vertical axis of an aggregate supply and aggregate demand diagram expresses the level of a price index like the Consumer Price Index or the GDP deflator—combining a wide array of prices from across the economy. The price level is absolute: it is not intended to be compared to any other prices since it is essentially the average price of all products in an economy. The horizontal axis of a microeconomic supply and demand curve measures the quantity of a particular good or service. In contrast, the horizontal axis of the aggregate demand and aggregate supply diagram measures real GDP, which is the sum of all the final goods and services produced in the economy, not the quantity in a specific market. In short, just because the AS–AD diagram has two lines that cross, do not assume that it is the same as every other diagram where two lines cross. The intuitions and meanings of the macro and micro diagrams are only distant cousins from different branches of the economics family tree.